Carp fishing methods have changed dramatically over the last ten years. 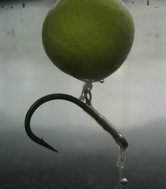 Carp rigs have become more sophisticated with new developments in hook bait presentation and the invention of numerous types of specialized hook lines made from materials with a whole host of properties. Today there are so many rig systems to choose from that for the beginner it can become frustrating to know which would be the best carp rig to use. Using a rig that is appropriate for the fishing venue would definitely help with catch rate. It could mean the difference between catching something and blanking, or even provide better success when chasing the bigger, wiser carp. For example, it may not pay to use clear rig tubing when fishing over a dark coloured lake bed, the tubing could be holding air causing it to show up clearly on the bottom. Any carp rig would work better if concealed effectively. There’s a much better chance a carp will take the hook bait if it can’t see a rig. In another situation you may be using the perfect rig for the chosen lake but a bigger hook size could render it useless. As like most tips for carp fishing a small change here or there could make a big difference in what the fish see, feel or smell. You should understand that just because a certain rig helped catch a few carp on one lake doesn’t mean it will work on another similar lake. The way the fish feed or the type of rigs the fish have been exposed to on a regular basis may reduce a rig’s effectiveness. The rig used should be adapted to the fishing venue as well as adapting to changes in ways fish feed. This may mean changing the rig during a fishing session as and when you learn about the carp’s movements and habits. More Carp Fishing Articles Here!